Sick of the usual salads and sandwiches when having lunch in your office? You deserve a hot bowl of soup every now and then. To easily achieve that kind of satisfaction, consider buying the best soup thermos for work. The most important feature for any soup thermos is the insulation. However, some options out there can only keep the soup hot for a few hours. For overtime at work as well as long-distance travels, Thermos Stainless King 24 Ounce Food Jar is perfect with its 14-hour retention for heat. Aside from being a good soup thermos, this product is also great for cold drinks. It can maintain a low temperature for 24 hours. 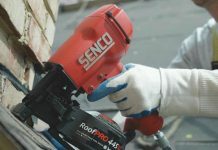 The big factor for this excellent feature is the brand’s advanced vacuum insulation technology. 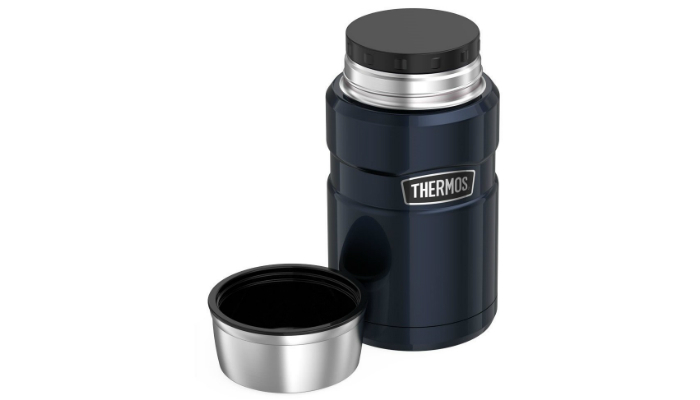 Now that we have an idea of how effective this thermos is, what about the temperature on its outer surface? Will it retain heat, too? Don’t worry; the surface will remain cool to touch no matter what. It can also prevent condensation. That means it will stay dry even if the drink is too cold. Durability should also be a concern when looking for a soup thermos. Some containers tend to wear out in just a few months. Fortunately, this one is tough inside and out because of its high-quality stainless steel surfaces. When it comes to convenience, the mouth is wide enough for easier refilling and cleaning. You may even eat the soup directly from the container. That means no more pouring into another bowl. 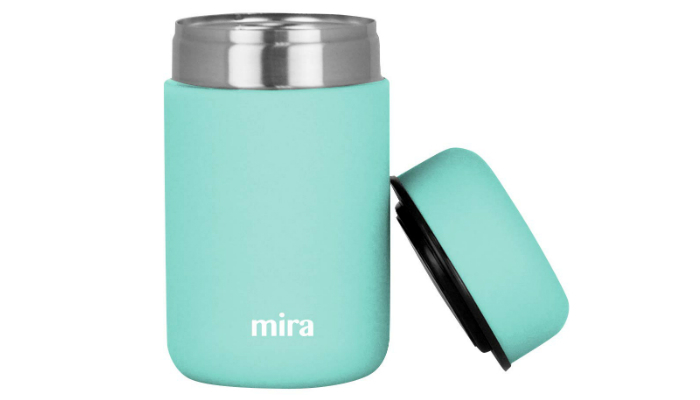 Even though it can only retain heat for a maximum of five hours, MIRA 13.5 Oz Vacuum Insulated Thermos is still a decent choice if you want soup for lunch. It specifically has a triple wall 18/8 stainless steel construction for insulation and durability. Having a big thermos is great for one hearty meal, but it can be too much for children. So, if you also have kids going to school, this option is really ideal. It is more than fifty percent smaller than the top product. Since safety is also a priority, you should know that this thermos doesn’t contain toxic things like bisphenol-A (BPA), polyvinyl chloride (PVC), lead, and phthalates. Another option made of 18/8 stainless steel, Stanley Adventure Vacuum Insulated Jar won’t rust. It is also naturally safe since it doesn’t contain BPA. The lid, which is obviously insulated as well, can serve as a bowl that can keep soup hot for a while even when poured from the thermos. It also contributes to the leak-proof feature of the entire product. 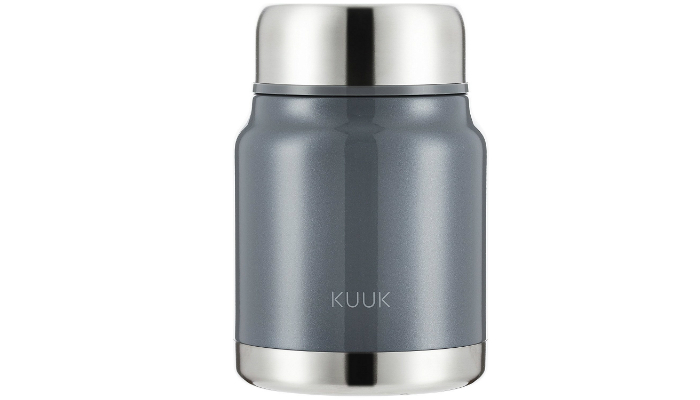 Because of its airtight inner cover, KUUK 17 oz Insulated Soup Flask to Go will never leak. That’s a delightful surprise, considering that the cover can be opened without any hassle. You just have to press the button. 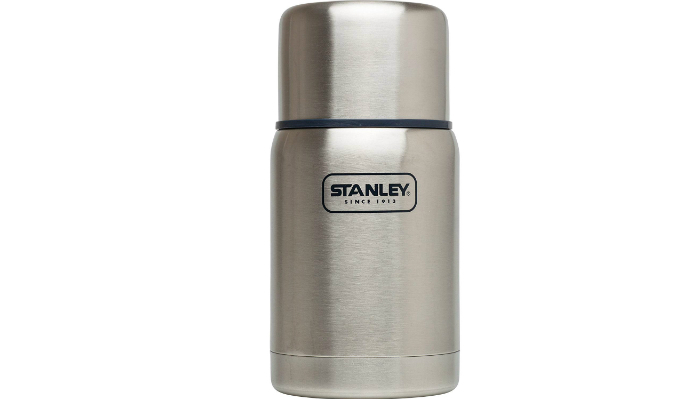 Another factor for the leak-proof benefit of this thermos is its heavy-duty stainless steel. The metal won’t break or bend no matter how crowded your bag is. 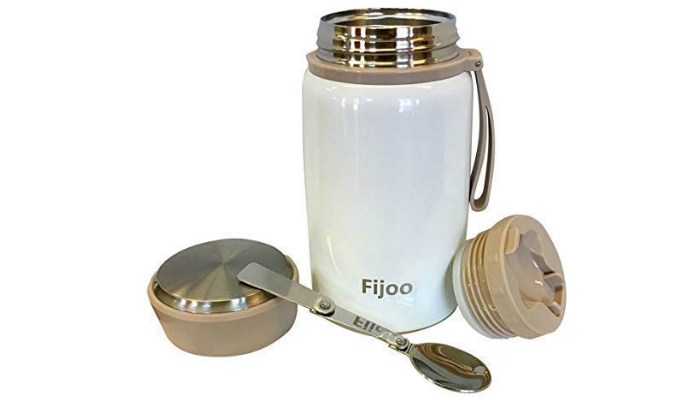 To enhance portability, Fijoo 27oz Stainless Steel Soup Thermos has a flexible handle. However, the cherry on top is the free folding spoon. Simply place it on the lid when not in use. Even though this thermos is a twist-to-open type, it is still considered hassle-free. After all, that type of lid only adds to the leak-proof guarantee of this product. There’s something unique about this product. 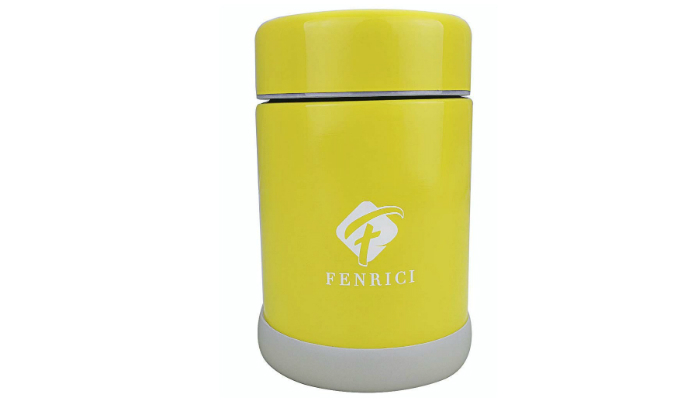 Fenrici BPA-Free Double-Wall Thermos has a base you can remove when it’s time for cleaning. The purpose of this feature is easier removal of vegetable, meat, or pasta chunks from the soup. For an affordable option like this, surely you’re curious about its level of insulation. This thermos can still retain heat for six hours. 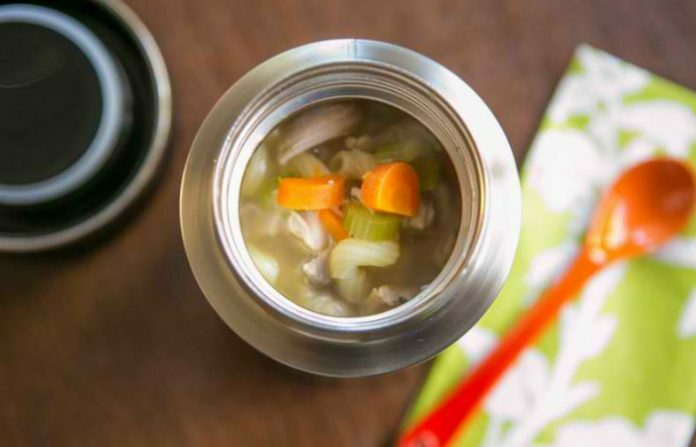 Since you’re going to put food in a soup thermos, you should think about safety before anything else. Insulation is important, sure, but your health is a priority rather than convenience. Before we proceed to the recommended material for a thermos, we’re going to discuss first what should be avoided. The obvious answer is plastic. Even if it’s BPA-free, it still has safety risks. Now, let’s discuss stainless steel. The 18/8 kind is highly recommended because it typically has no BPA, phthalates, and lead. What would happen if you use a thermos containing harmful chemicals? BPA is linked to obesity, diabetes, and cancer. 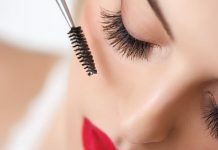 Meanwhile, in the long run, phthalates can affect fertility among men. Lastly, lead promotes kidney damage and high blood pressure. Finally, let’s talk about insulation. It gives a thermos its main purpose which is to keep the contents hot. Stainless steel is the perfect material for insulated containers. It is so effective at trapping heat for retention. It will also keep the surface cool to protect your hands. Size is a huge factor to make a soup thermos very portable. The container should be big enough for a satisfying meal but compact to easily fit most bags. More importantly, the thermos should be leak-proof. An airtight twist lid or cover is ideal. For easier cleaning, the mouth should be wider than a typical thermos. This will let you effortlessly insert the sponge while washing the container. A wide mouth is also practical when you eat directly from the thermos. Your spoon will easily go in and out of it. Other features you might like are handles, foldable spoons, and lids that can be used as bowls. 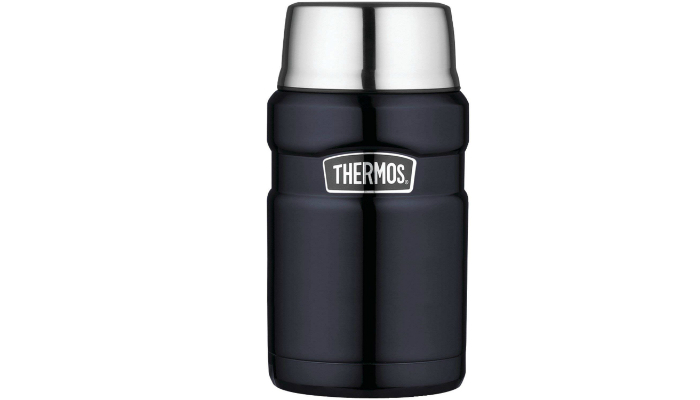 Thermos Stainless King 24 Ounce Food Jar is the best soup thermos for work. 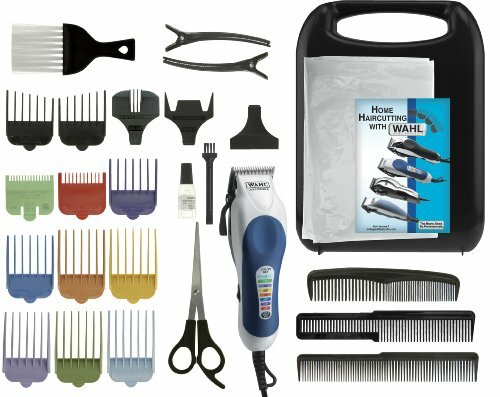 Aside from the brand being a household name, this product is reliable because of its high-tech insulation and food-grade stainless steel. It also uses the standard dimensions and features for portability and convenience. Come to think of it, you won’t be able to enjoy the benefits of a high-quality thermos if the soup isn’t delicious enough. To help you cook tasty soup with perfect consistency, we recommend immersion blenders. If not soup, we suggest bringing chili to work. Learn how to make chili like a pro. For other products you might like, check out the best travel mugs. When things get too busy at work, try to follow some home management tips for working moms.